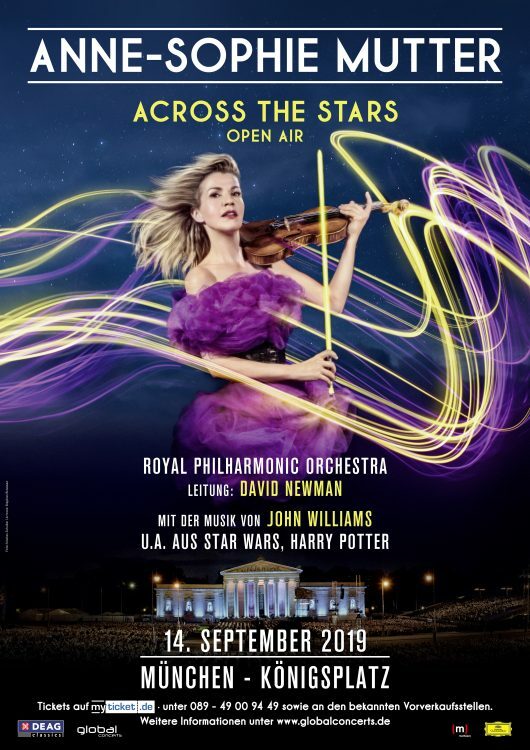 With ACROSS THE STARS Anne–Sophie Mutter will present on September 14th, 2019, some of the most outstanding works of composer and multiple Oscar Award-winner John Williams in the dream-like scenery of Munich Königsplatz. Anne-Sophie Mutter will be accompanied by the renowned Royal Philharmonic Orchestra London conducted by David Newman. It will be the first-ever open-air concert of Mutter’s unprecedented career. After the success of The Club Album, one of Anne-Sophie Mutter’s long-cherished dreams comes true: In collaboration with her exclusive record label Deutsche Grammophon she devotes her new album ACROSS THE STARS to the memorable Oscar and Grammy Award-winning melodies by John Williams from Star Wars, Schindler’s List, Memoirs of a Geisha or Munich. The album, which will be released in 2019, also forms the basis for this very special concert. Anne-Sophie Mutter and John Williams have been close friends for many years, which imbues this project with a truly special meaning: “Most of the works I will perform with the Royal Philharmonic Orchestra in Munich have been especially arranged for me – the pieces are absolutely new in this form and will be performed at this concert for the very first time!" Mutter explains. The programme will include pieces from Star Wars, Schindler’s List, Memoirs of a Geisha, Harry Potter, Dracula and Munich. Anne-Sophie Mutter is a musical phenomenon. For more than 40 years, she has been a fixture in all the world’s major concert halls, making her mark in the classical music scene as a soloist, mentor and visionary. The four-time Grammy® Award winner is equally committed to the performance of traditional composers as to the future of music. So far, she has given world premieres of 26 works by Unsuk Chin, Sebastian Currier, Henri Dutilleux, Sofia Gubaidulina, Witold Lutoslawski, Norbert Moret, Krzysztof Penderecki, Sir André Previn, Wolfgang Rihm, and John Williams have composed for Anne-Sophie Mutter. Furthermore, she dedicates herself to numerous benefit projects and to supporting tomorrow’s musical elite. In a career spanning more than five decades, John Williams has become one of America’s most accomplished and successful composers for both film and the concert stage. His works with Steven Spielberg and George Lucas have given his music an immortal status for both film and classical music fans. John Williams has received five Academy Awards and fifty-one Oscar nominations, making him the Academy’s most-nominated living person and the second-most nominated person in the history of the Oscars. He also has received seven British Academy Awards (BAFTA), twenty-four Grammys, four Golden Globes, five Emmys, and numerous gold and platinum records. Especially with his film music for Star Wars, E.T. and Jaws, he has created themes which impacted generations of film-goers. For more than seven decades the Royal Philharmonic Orchestra (RPO) has been at the forefront of music-making in the UK. Its home base since 2004 at London’s Cadogan Hall serves as a springboard for seven principal residencies as well as more than forty-five concerts per year in a long-term partnership with venues across the country. The making of great music at the highest level for the widest possible audience remains the RPO’s artistic priority. As the RPO proudly looks to its future, its versatility and high standards mark it out as one of today’s most open-minded, forward-thinking symphony orchestras. With a wider reach than any other UK large ensemble, the RPO has truly become Britain’s national orchestra. David Newman is one of today’s most accomplished creators of music for film. In his 25-year career, he has composed the music for more than 100 films, ranging from The War of the Roses, Matilda, Bowfinger to The Spirit, Behaving Badly and Tarzan. Newman’s music has brought to life the critically acclaimed dramas Brokedown Palace amd Hoffa as well as top-grossing comedies Norbit, Scooby-Doo, The Nutty Professor, Flintstones and award-winning animated movies Ice Age, The Brave Little Toaster and Anastasia. Newman is also a highly sought-after conductor and appears with leading orchestras throughout the world, including the Los Angeles Philharmonic, the Royal Philharmonic Orchestra, the Boston Symphony, the Philadelphia Orchestra, the Chicago Symphony and the New York Philharmonic.